What if the solar system revolved around the Earth? That’s what scientists believed for many years. But Galileo was one of the first scientists to prove that the solar system actually revolved around the Sun. Galileo also invented an improved telescope that allowed him to see far into space. He first saw Jupiter’s moons and realized that our moon was covered with craters. Although Galileo was a brilliant physicist and mathematician, his personal life was not easy. Galileo was born in Pisa, Italy in 1564 and was a brilliant scientist, physicist and mathematician. Keep reading for more all about Galileo Galilei. Galileo was born in Pisa, Italy in 1564. He attended college but dropped out because he ran out of money. 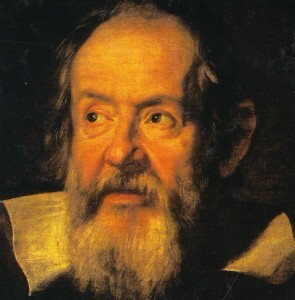 Galileo later became a professor. The Catholic church did not like Galileo’s findings. They forbid him to write or teach about his work. Galileo did not listen. He was tried and found guilty. He was put under house arrest. He had to stay in his house and could not invite people over. He could not send his writings out. Galileo continued to work and study. He wrote booklets and sent them to France and Holland. Galileo was one of the first scientists to prove that the solar system actually revolved around the Sun. A short biography video of Galileo Galilei. Question: Did Galileo have any children? Answer: Galileo had three children. One of them, a nun, was one of his most devoted friends and supporters when he was imprisoned. Enjoyed the Easy Science for Kids Website all about Galileo Galilei info? Take the FREE & fun all about Galileo Galilei quiz and download FREE Galileo Galilei worksheet for kids. For lengthy info click here.